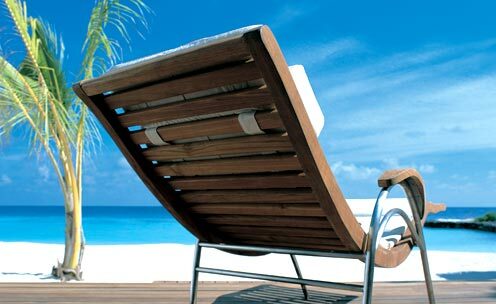 If you are looking for a holiday of indulgence and stunning surroundings, look no further. 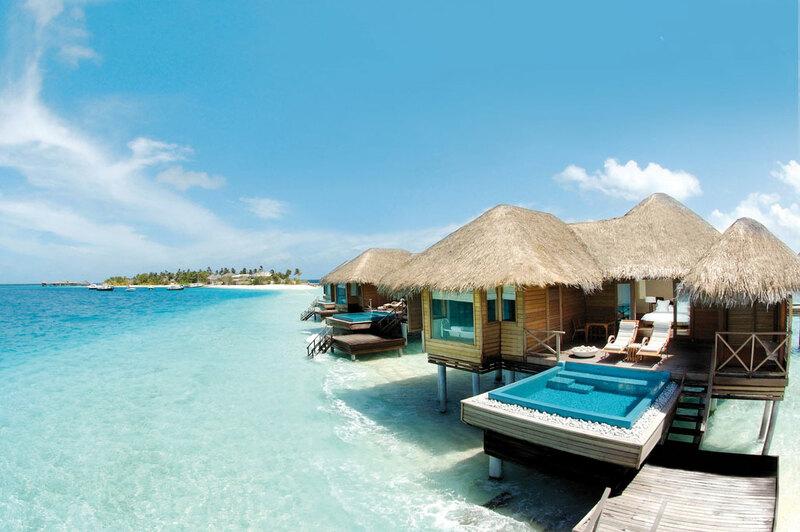 45 minutes by speedboat from Malé lies Huvafen Fushi Spa Resort – your chance to immerse yourself in tropical luxury and return back home feeling refreshed and rejuvenated. 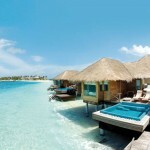 Minimalistic appearance in combination with exceptional service makes Huvafen Fushi a hidden gem in the Indian Ocean. 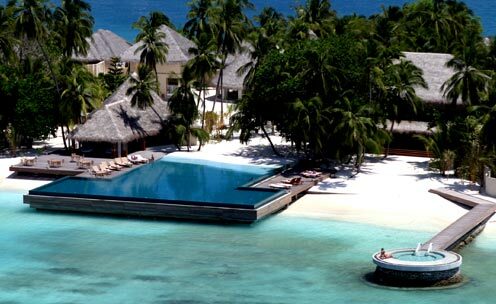 This idyllic resort offers exclusive accommodation, buzzing entertainment and amazing cuisine from all over the world. Start off your evening with a private wine tasting session in the impressive wine cellar, before you dine in front of the sensational lagoon. 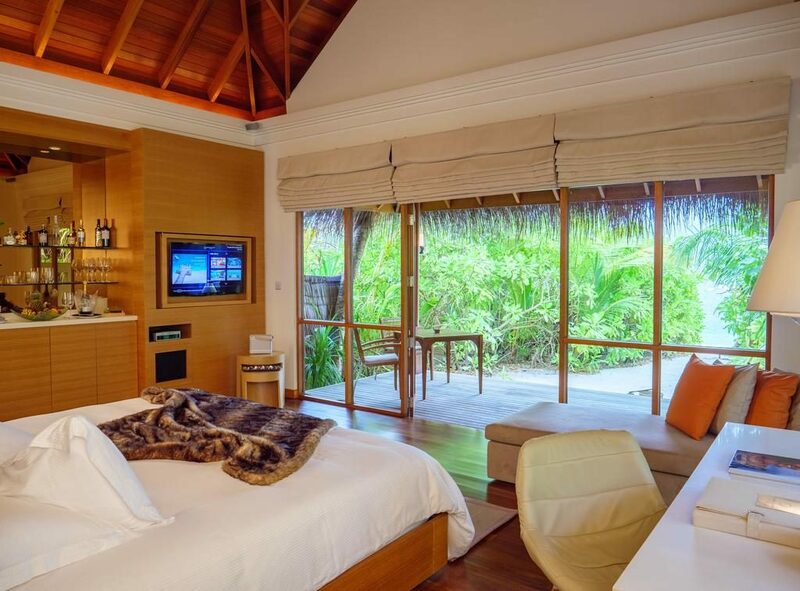 Back in your lavish villa, you will look forward to waking up to your next day in this luxurious paradise. 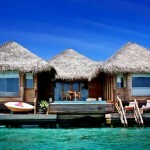 The Beach Bungalow (125 sqm) is looking directly onto the turquoise lagoon and the white powdery beach by the main jetty. 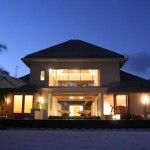 A day bed, private bar and open-air bathroom are features of this lovely accommodation. 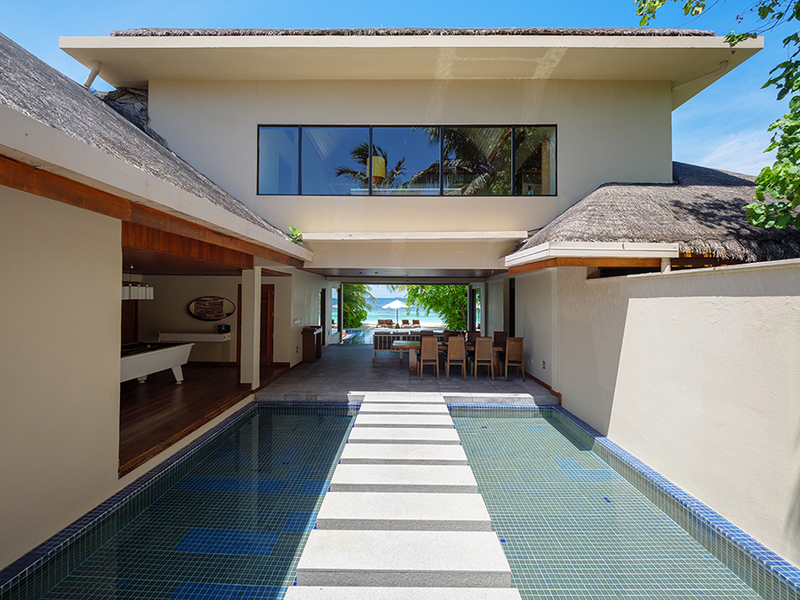 When you want to cool off, you can either take a dip in your private plunge pool or use the amazing outdoor rain shower. 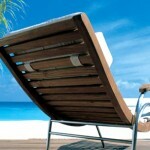 The Beach Bungalow is the ideal comfortable accommodation for those wanting privacy during their holiday. 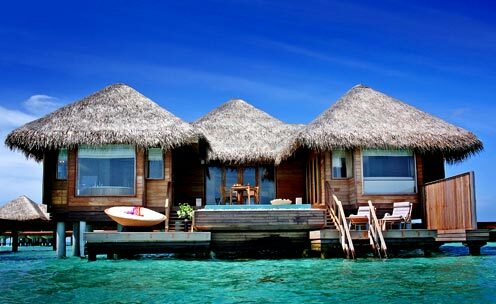 The Lagoon Bungalow (130 sqm), boasting a unique split level layout, leads directly into the warm lagoon from your private sundeck. 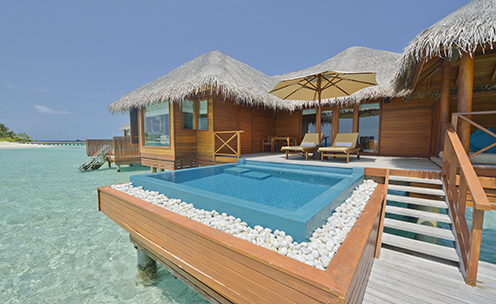 This makes the exclusive Lagoon Bungalow ideal for soaking up the sun, going for refreshing swims and enjoying amazing sunsets. 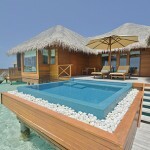 Your own private freshwater pool and outdoor bathtub are other luxurious features. 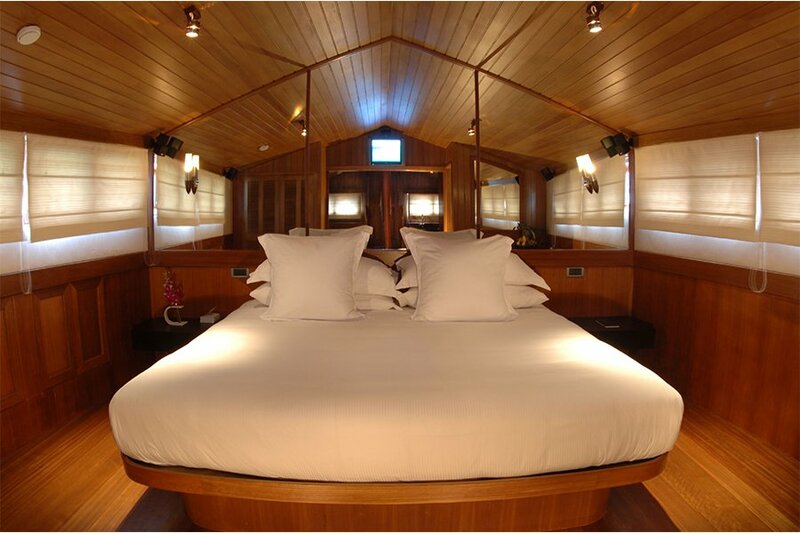 If you are looking for romantic indulgence, the Lagoon Bungalow is the perfect choice. 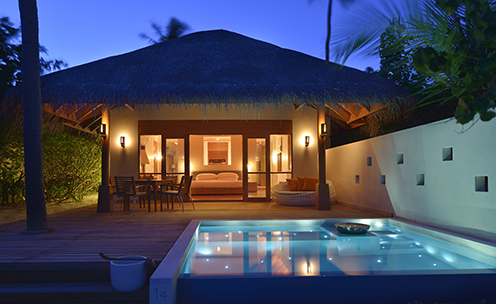 The Deluxe Beach Bungalow with plunge pool (160 sqm) was designed with outdoor lovers in mind. 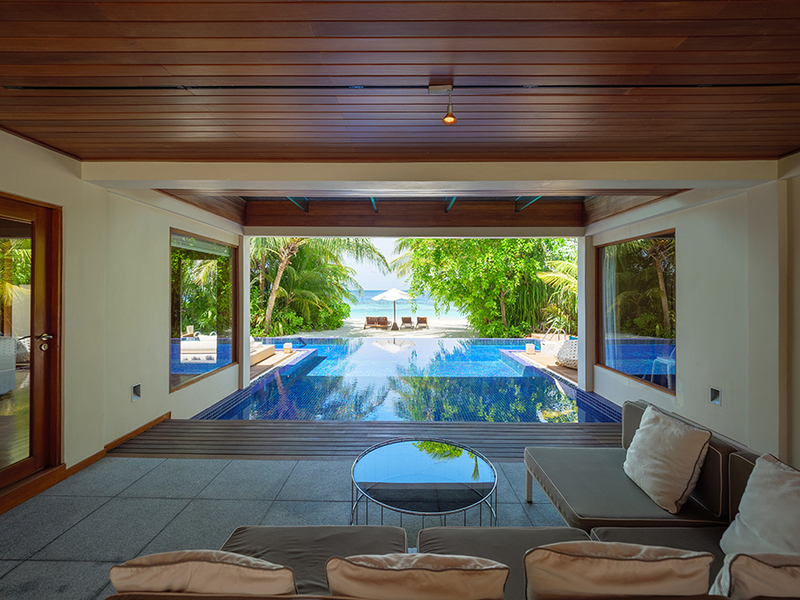 Being surrounded by tropical vegetation and boasting a large outdoor area with a private plunge pool, you will spend all day long outside. 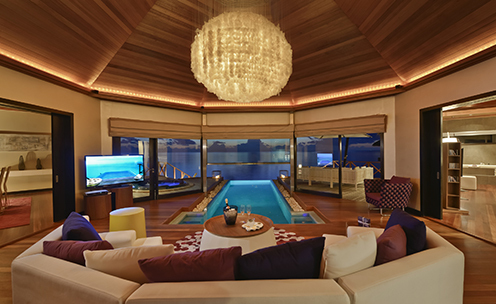 The villa itself is decorated with exquisite designer furniture. 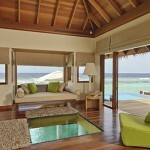 The Ocean Bungalow (160 sqm) is a spacious accommodation, so lavish and comfortable that you won’t want to leave. You have a private three-tier deck, giving you instant access to the tropical lagoon as well as your own amazing fresh-water infinity pool and sundeck. 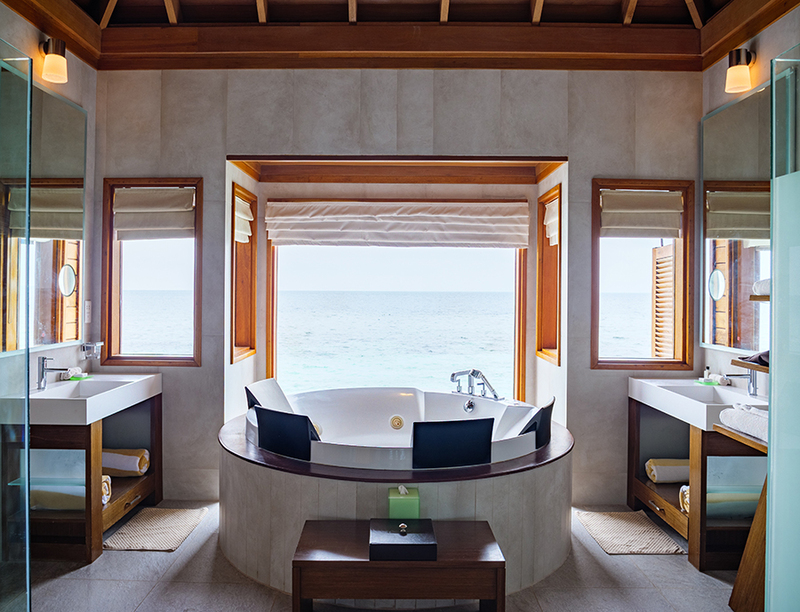 The Ocean Bungalow features a private massage room with glass floors, and a Jacuzzi bath providing you with magnificent views of the surrounding Indian Ocean. 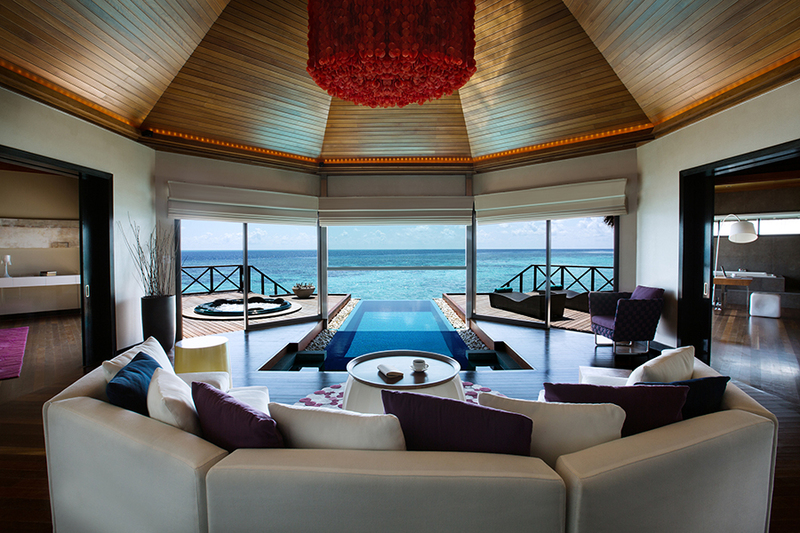 The Ocean Pavilion (330 sqm) is one of the most extravagant accommodations of Huvafen Fushi. 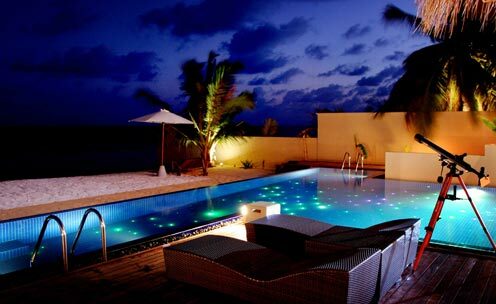 Widely spread over the sensuous Indian Ocean with amazing sunset views, the Ocean Pavilion is perfect for newlyweds. 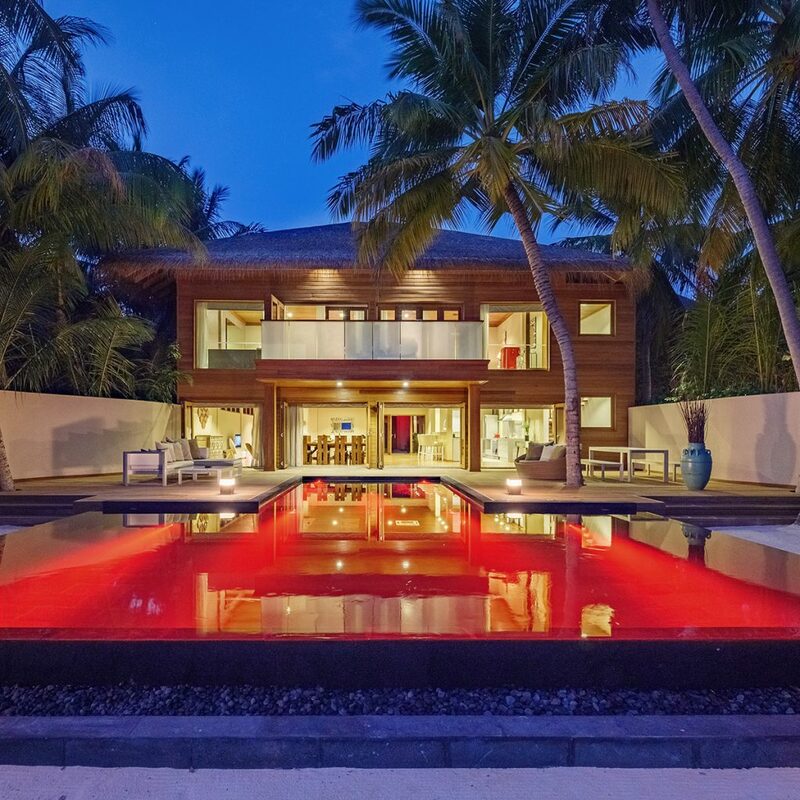 The private pavilion gives you exclusive access to a spectacular fiber optic infinity pool which becomes seemingly part of the horizon when lit. 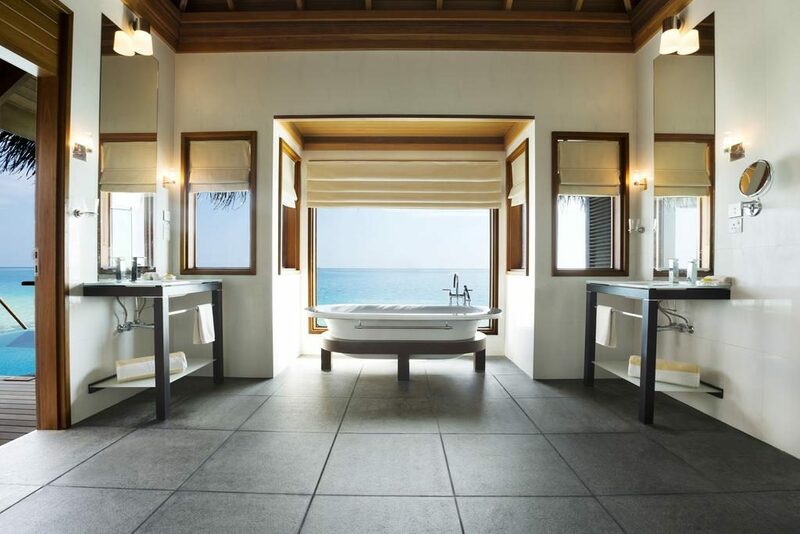 Additional luxury comes in the form of a hydro spa shower and attentive 24 hour butler service. 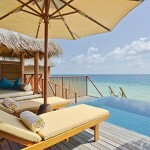 The Beach Pavilion (800 sqm) is pure bliss, with its avant-garde design and private luxurious facilities. 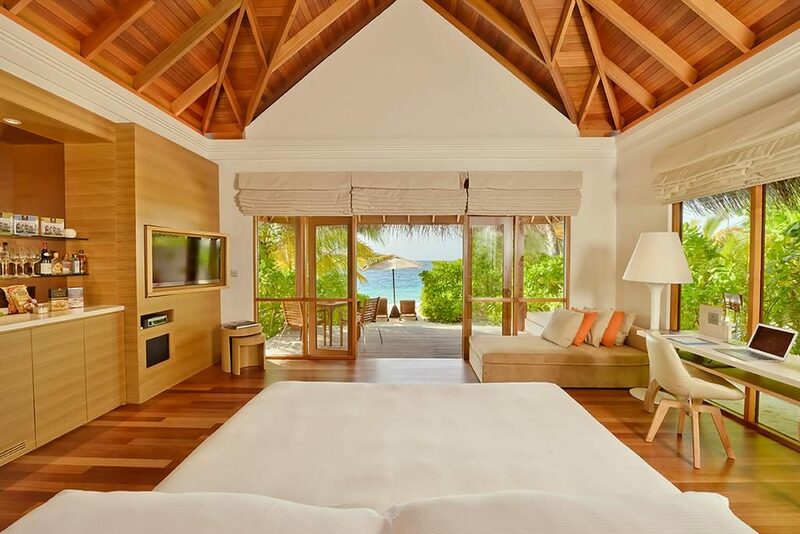 This accommodation is located on the eastern tip of the island and boasts two lavish bedrooms, making it perfect for families wanting to experience a secluded Maldives holiday. 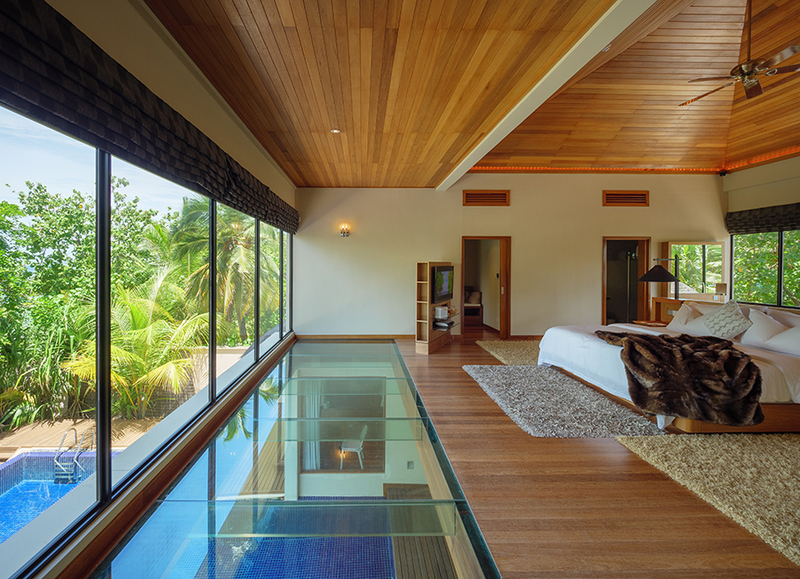 The master bedroom is stunning and features glass floor, and floor to ceiling windows facing the gorgeous infinity pool. 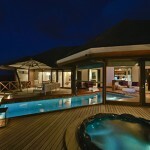 There is also an open-air bathroom with an exotic rain shower, as well as a lush private garden area. 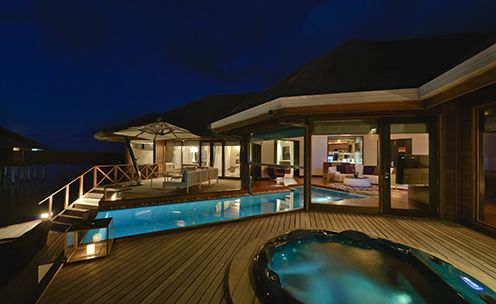 Your private dining area overlooks the incredible fibre optic lit infinity pool. 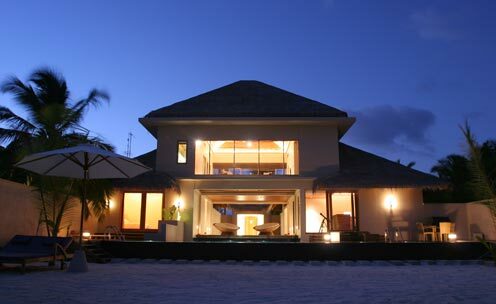 Guests of the Beach Pavilion can make use of 24-hour butler service. 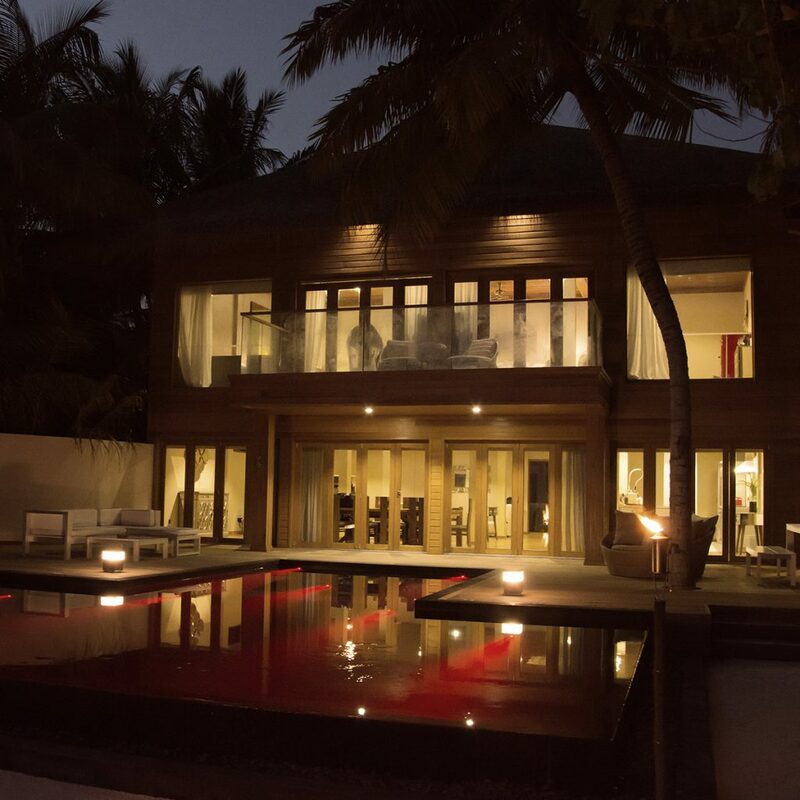 The Playpen (800 sqm) is a truly luxurious Maldivian penthouse, this glorious residence is Parisian chic meets Upper Eats side, New York. 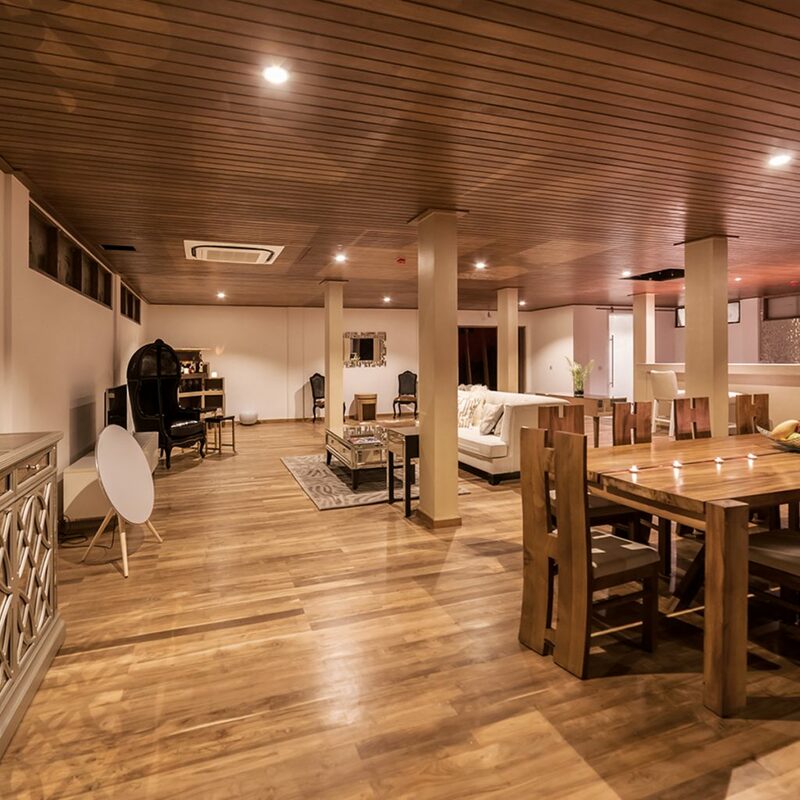 Trendy throughout with lush furnishings and comfortable cosy spaces. 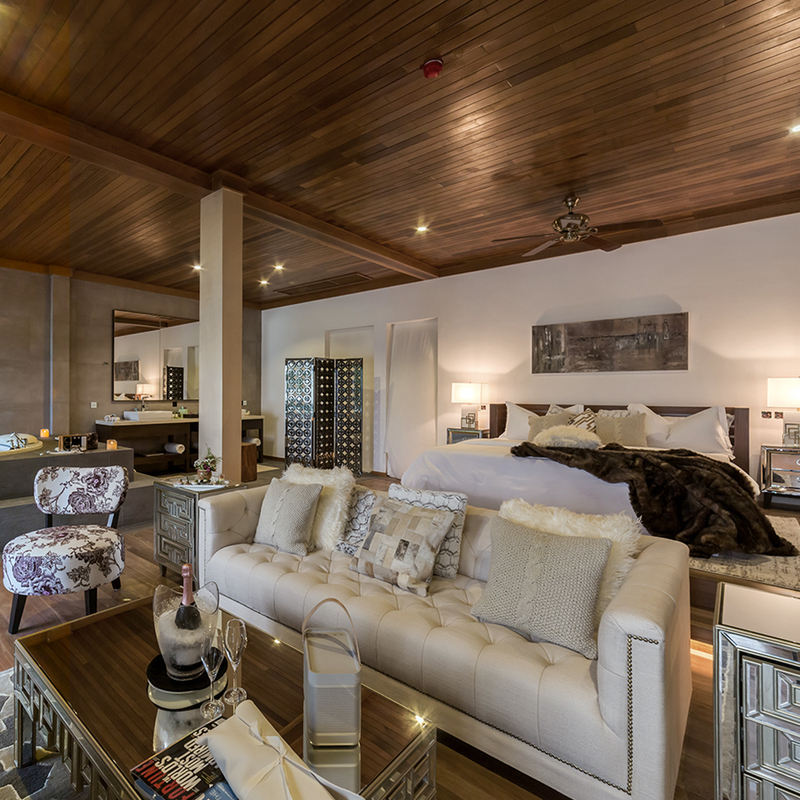 The stunning elevated master bedroom is open plan with a playroom featuring an oversized bath with ocean views. 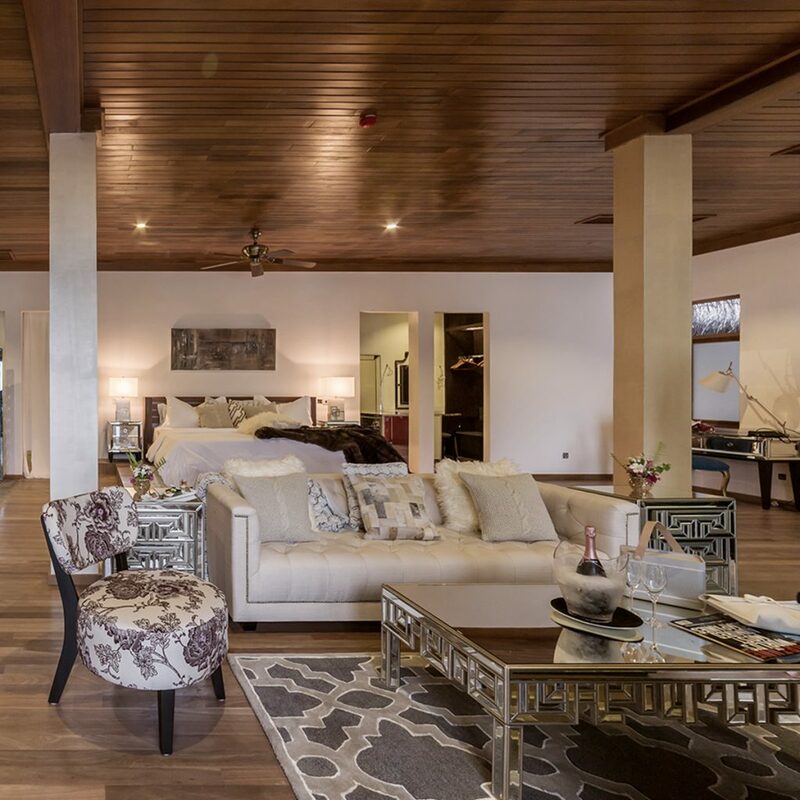 The residence also enjoys a steam room, sauna and wet room with an elegant balcony overlooking the generous black lava stone infinity pool. Downstairs the open plan living area offers a lounge, dining areas, with a chic cocktail bar and culinary gallery to indulge in. 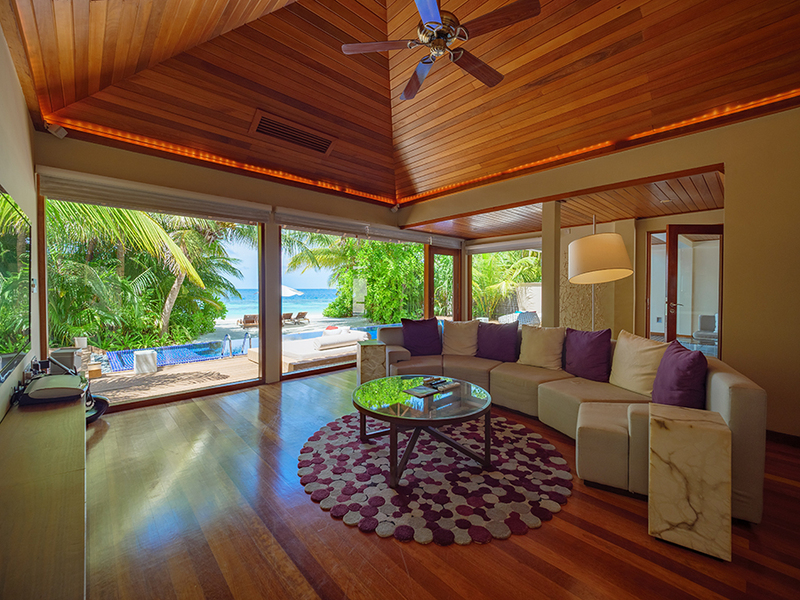 The private gardens are lush and tropical, providing privacy and lead to the beachfront and can be accessed directly from the house reef. 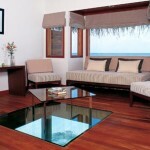 A Thakuru (Maldivian word for butler) is available to guests staying in The Playpen 24 hours a day. 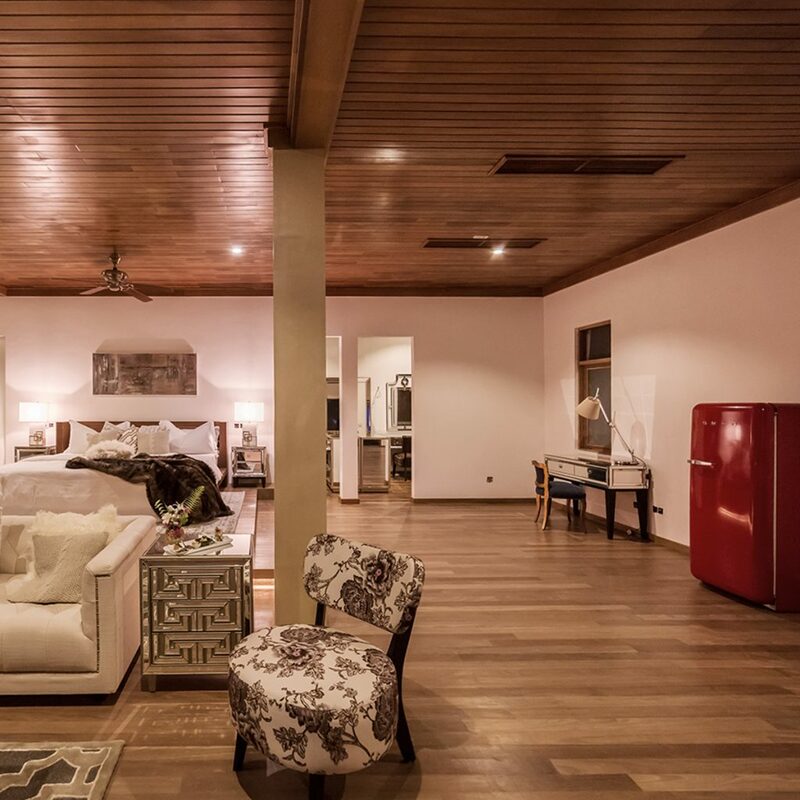 This residence is a truly bespoke memorable experience, the care and attention to detail here makes your stay beyond magical. 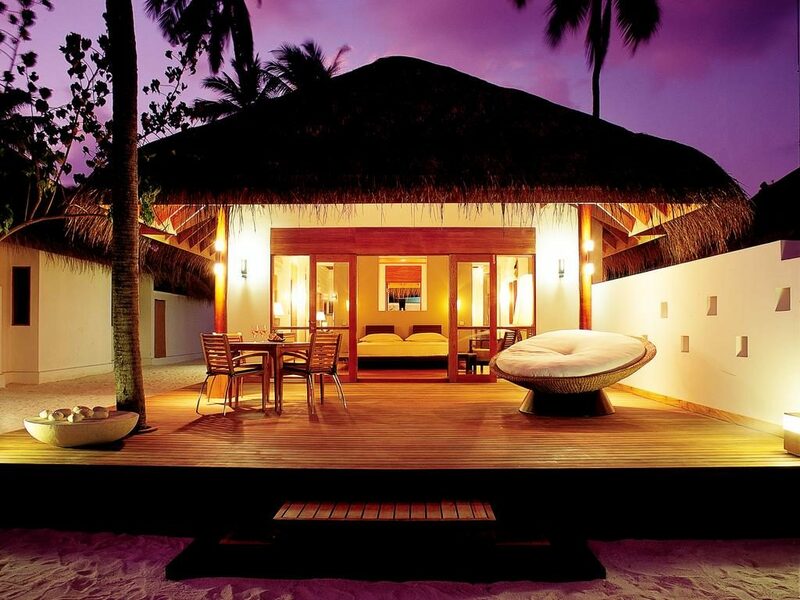 Every night spent here is paradise. 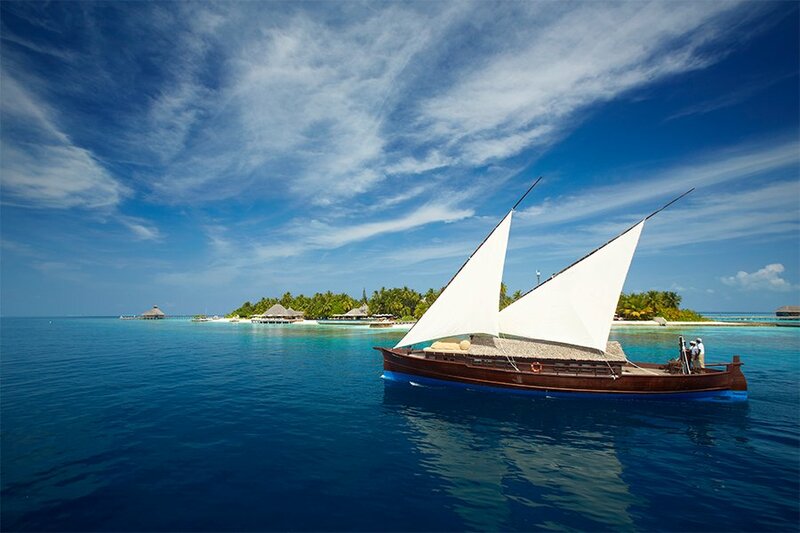 A traditional dhoni takes the indulgent Huvafen Fushi experience to open water. 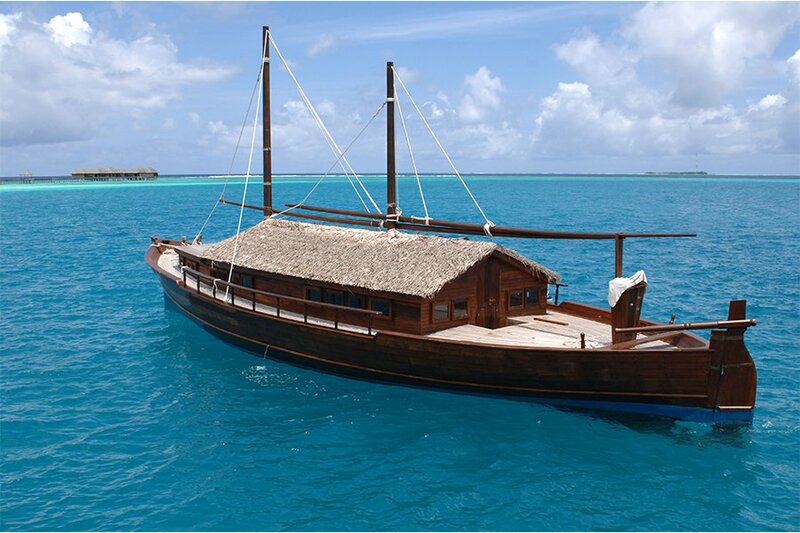 This 65ft vessel lets you sail the Maldives on your own. 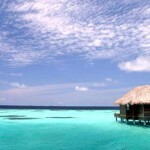 Exploring reefs by day. 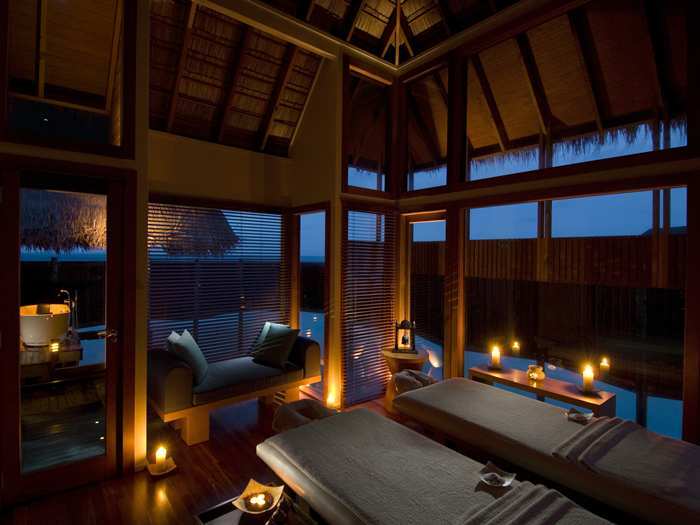 Pampering yourself and your partner, by night. 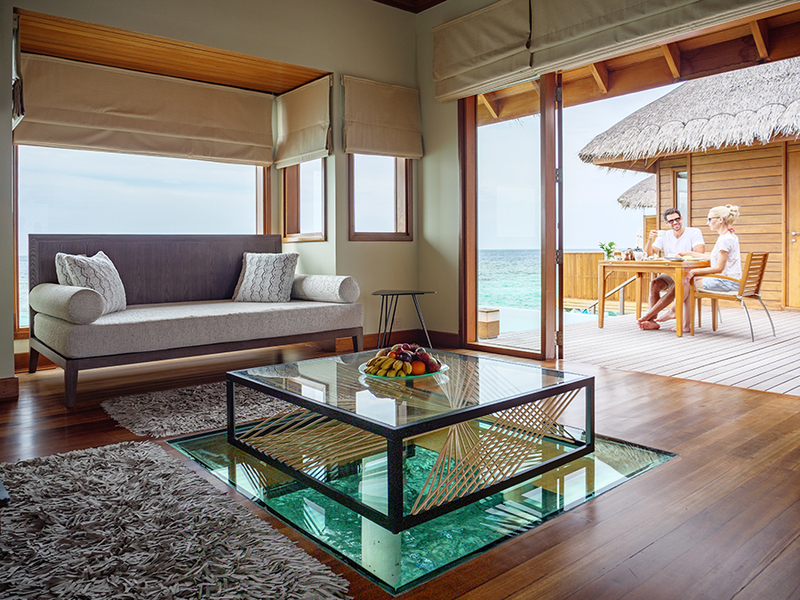 The dhoni can be booked with any room, complete with a 24-hour crew to give you the ultimate freedom to explore the Maldives from the most comfortable accommodation. 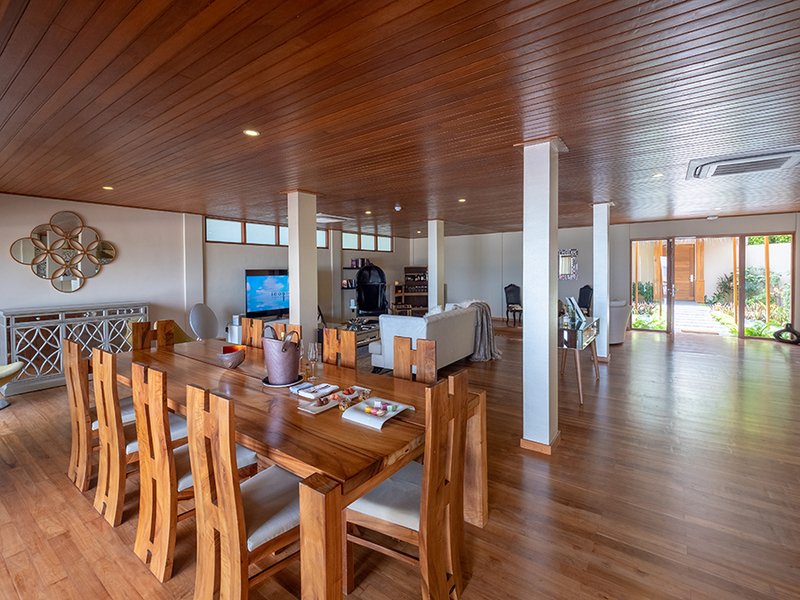 The below-deck living spaces are cool and quiet, there you can find everything you need: a king bed, wine cellar and an indulgent gourmet minibar. 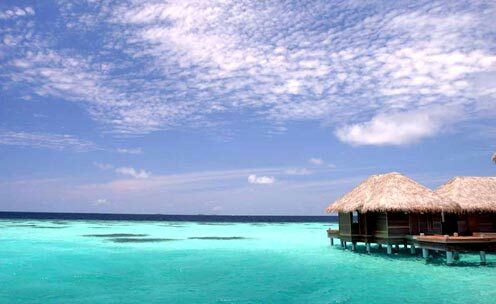 On the ocean, there is a world discover. 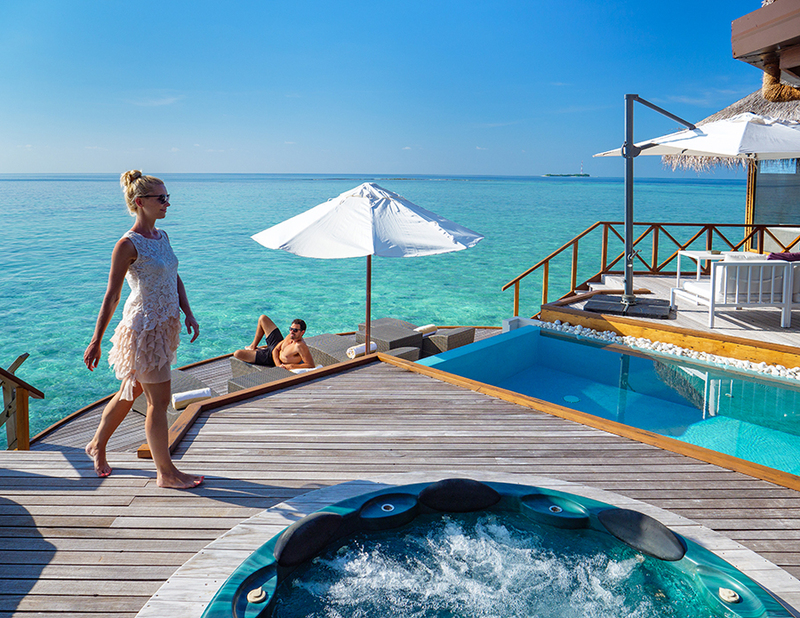 Not only does Huvafen Fushi Spa Resort provide its guests with stunning accommodation in a relaxed tropical setting, but the range of facilities and activities available is impressive. 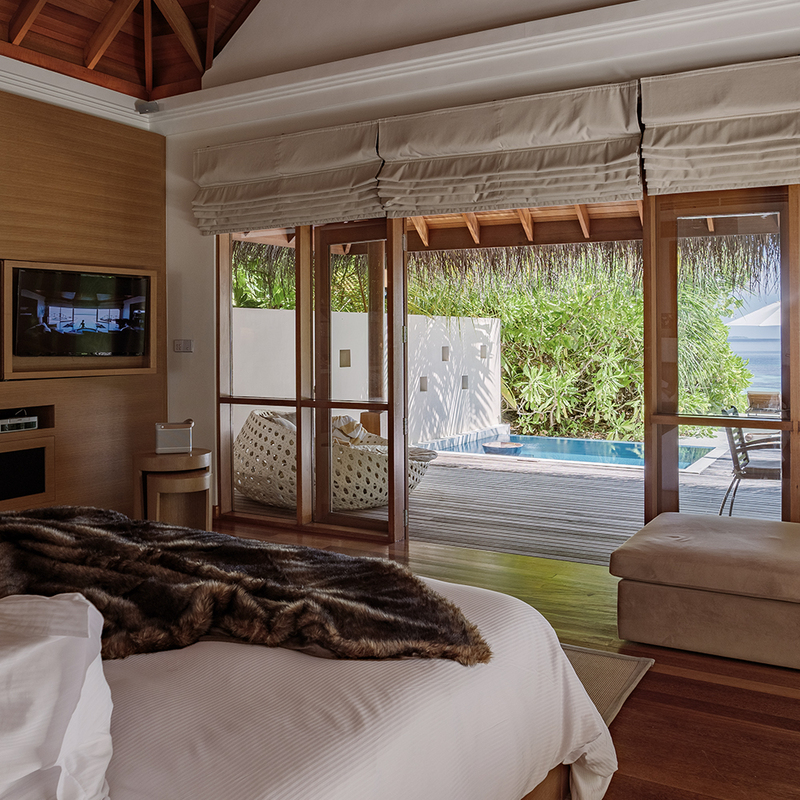 The exclusive boutique, fully-equipped gym, high speed Internet access and laundry service help to make your Maldives holiday even more relaxed. 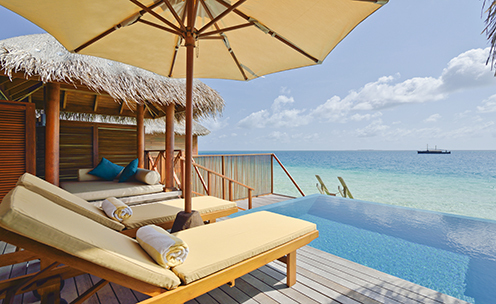 And if long days of sunbathing by the glistening Indian Ocean or the extraordinary swimming pool leaves you wanting more, the turquoise waters of the ocean has the answer. 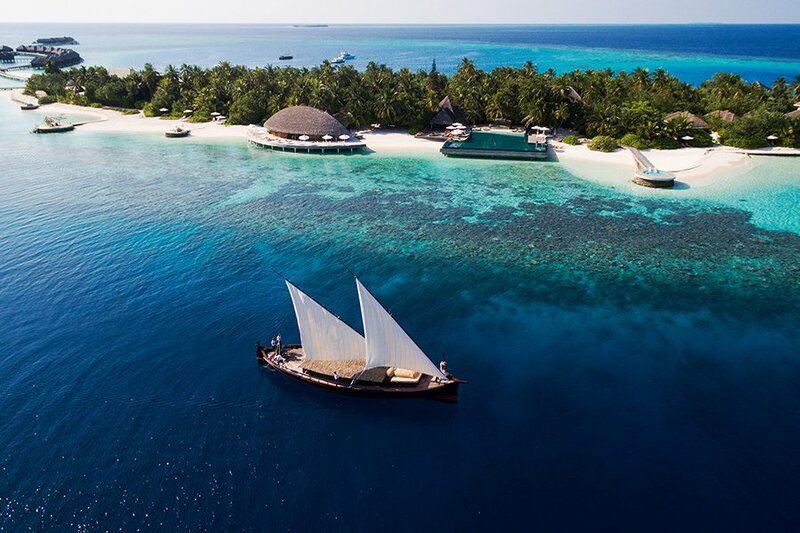 Amazing scuba diving, deep sea fishing, snorkeling, canoeing, banana rides and catamaran rides… how you choose to experience the marvellous ocean is completely up to you. 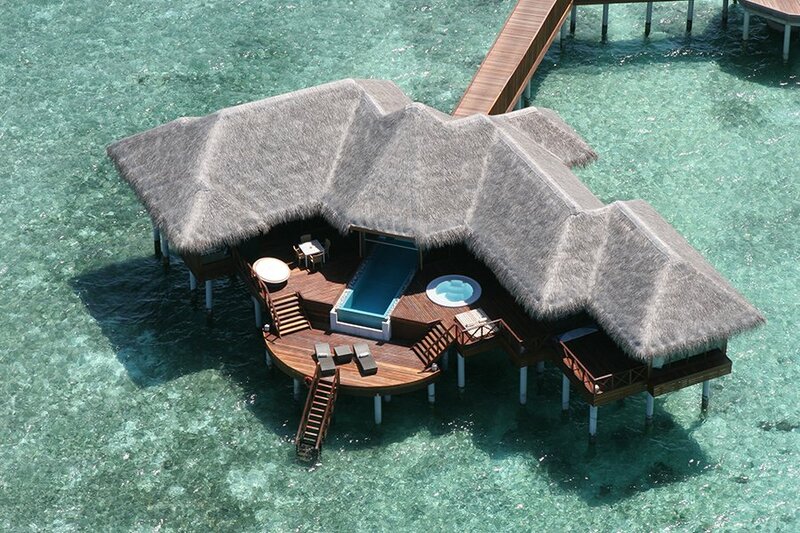 The LIME spa is a spa like no other… Being the first spa in the world to offer treatments under water, it’s a ‘must do’ for all guests at Huvafen Fushi. 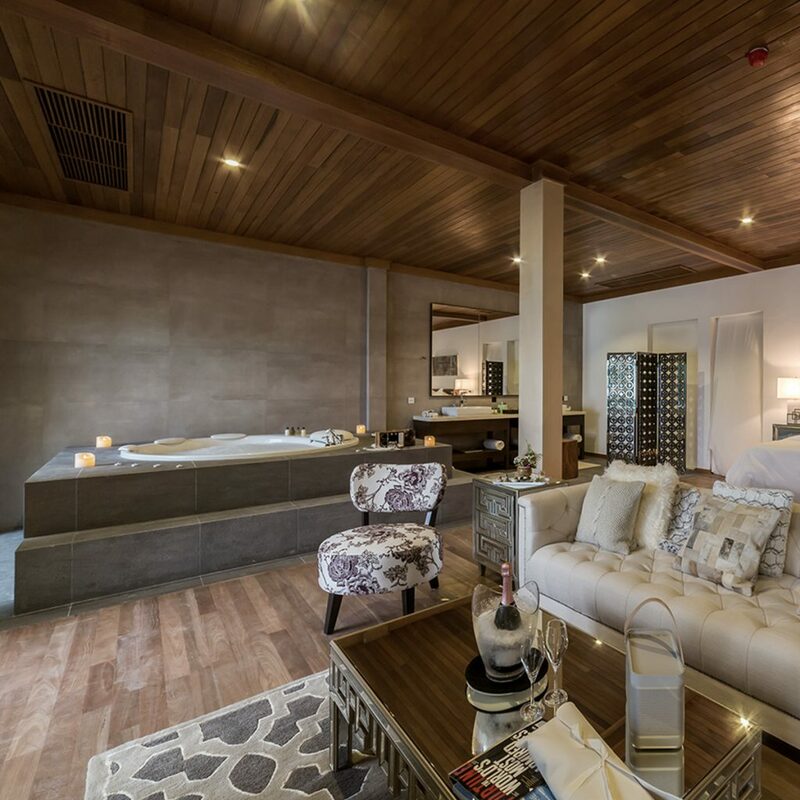 From soothing facials to relaxing massages, this beautifully designed spa makes you feel rejuvenated from the moment you sign up for your treatment. 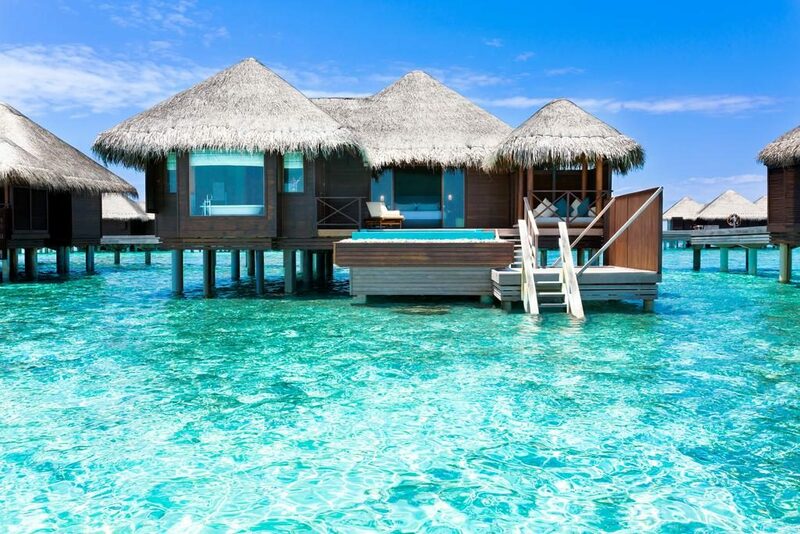 Having incredible marine life only inches away enhances your feeling of being one with the Indian Ocean, which is highly suitable since most treatments at LIME spa are inspired by the sea. 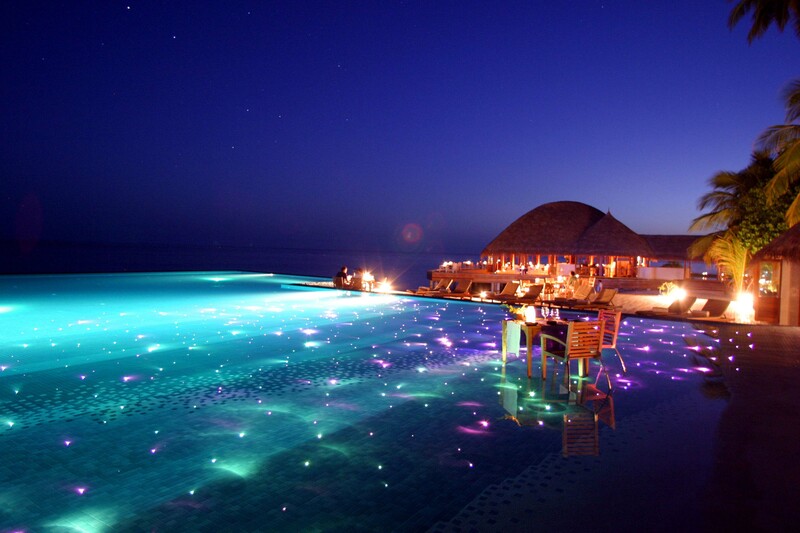 Dining doesn’t get much more magic than this. 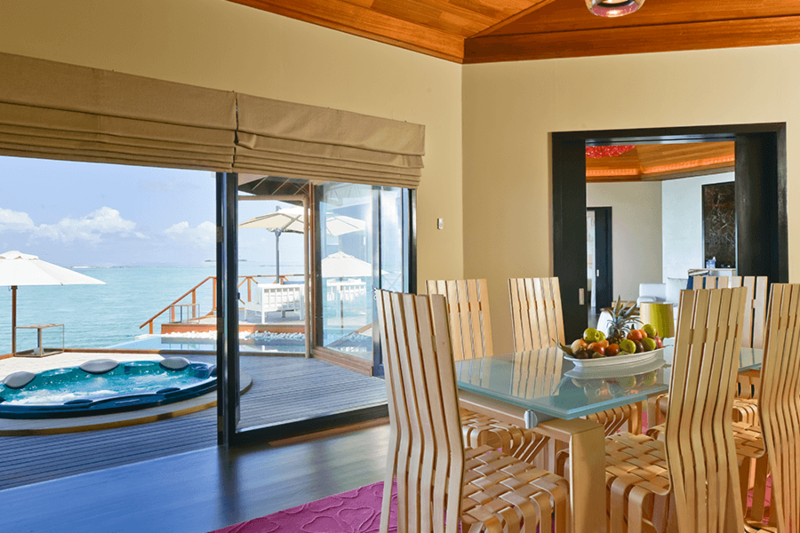 Each meal on your Maldives holiday at Huvafen Fushi will fulfill your culinary wishes. 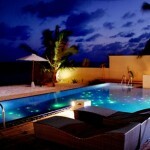 Celsius is the laid back, yet luxurious, main restaurant of Huvafen Fushi. 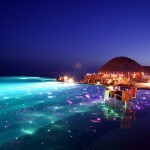 This romantic restaurant is spread out across the white sandy beach and you can choose whether to dine inside or outside. 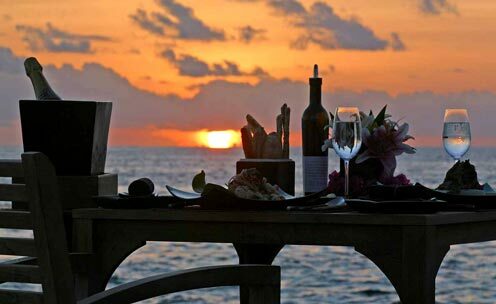 A candlelit dinner in the sunset at Celsius is an unforgettable experience. Destination Dining is a must try for each guest. 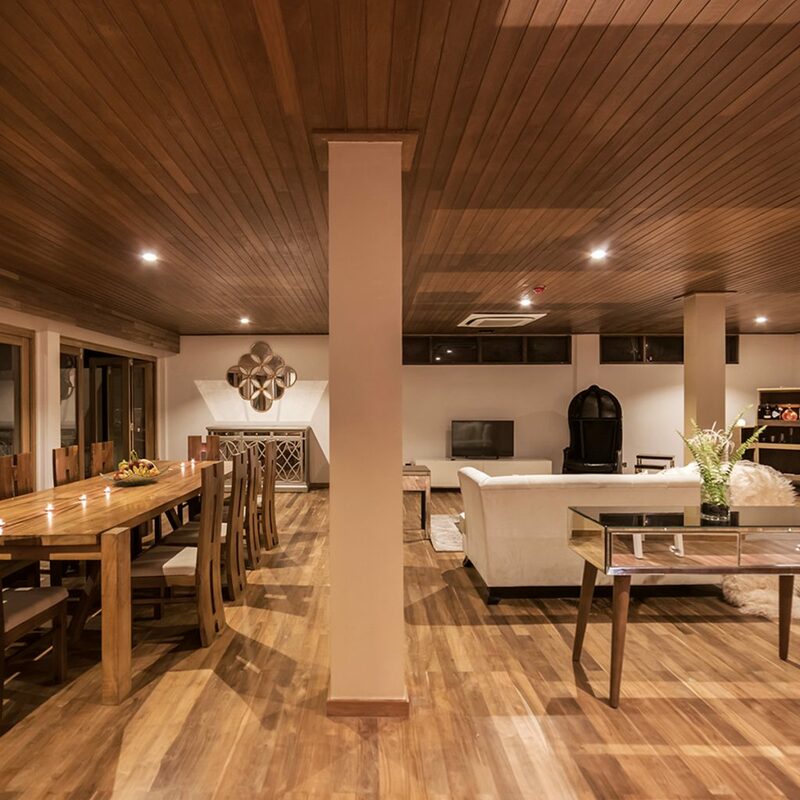 With private dining experiences in the underwater wine cellar, under the starry sky or perhaps in your villa, this is as exclusive as it gets when it comes to dining. 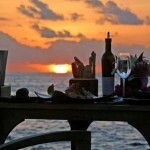 Fogliani’s is a restaurant where you can enjoy casual dinners in a laid-back atmosphere directly on the pristine beach. Wood-fired pizza has never tasted this good. Raw serves unique healthy food for rejuvenation of your body and soul. Natural ingredients are combined into creative dishes. 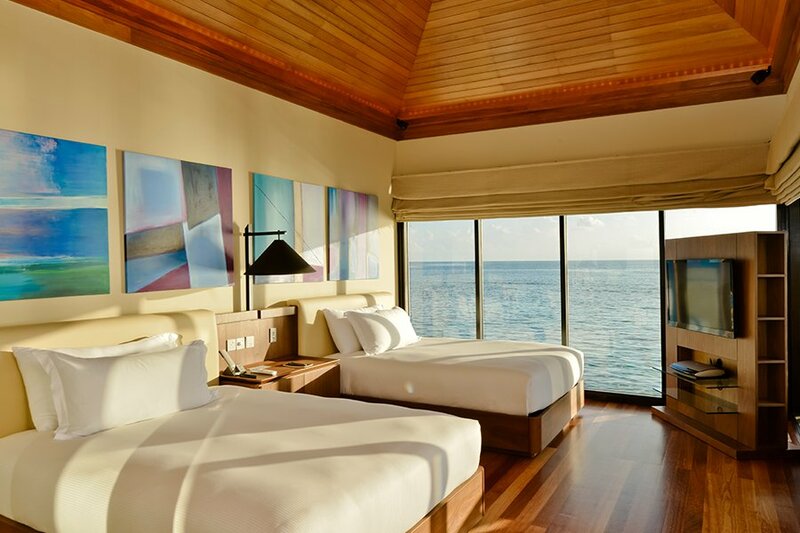 Salt’s main feature is its striking views of the horizon. 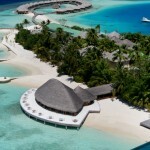 The menu is inspired by the Indian Ocean, meaning no other restaurant on the island is serving more exquisite seafood. 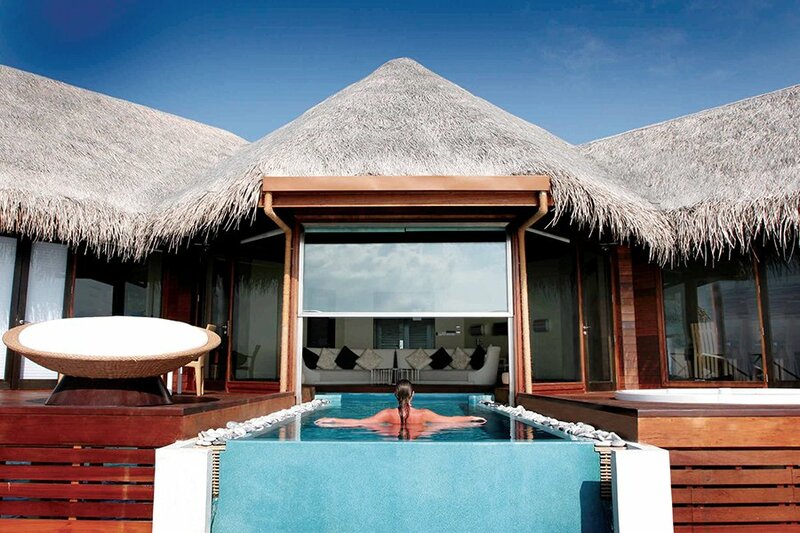 UMBar overlooks the chic infinity pool. 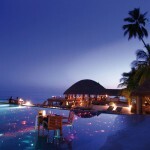 This stylish, yet romantic bar, offers you a vast range of delicious drinks and fresh coconuts. 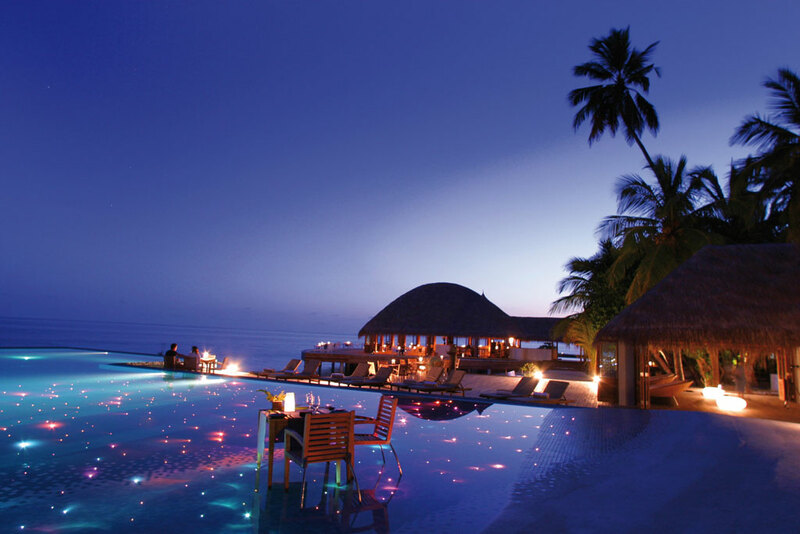 Vinum is perhaps the coolest hangout at Huvafen Fushi. 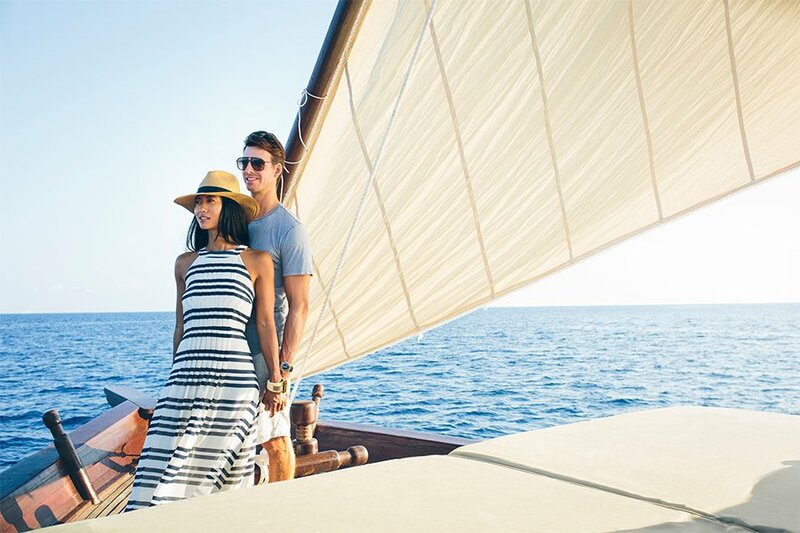 Indulge in first class wines and Champagne for a truly glamorous holiday. 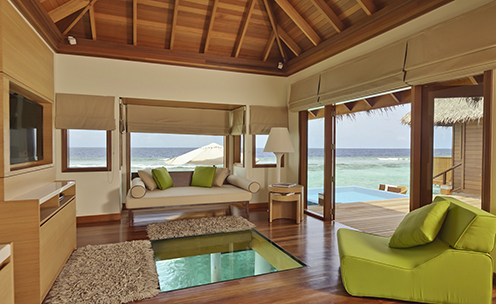 Simply Maldives Holidays offer a Bed and Breakfast package and a Half Board package for guests staying at Huvafen Fushi Spa Resort.